The bone morphogenetic protein (BMP) signaling is a highly conserved pathway from worm to human. The BMP signaling (monitored by P-MAD) is dynamic in the follicle cells during oogenesis. Early signaling is along the anterior-posterior (AP) axis, and late signaling acquires a clear dorsal-ventral (DV) polarity, shown as two domains symmetrically distributed on both sides of the dorsal midline (Green, arrow head marks the midline). The dynamics of BMP signaling reflect the changes in the BMP type I receptor Thickveins (Tkv). The early uniformly expressed tkv appears later as two dorso-lateral patches on both sides of the midline (tkv in situ hybridization). 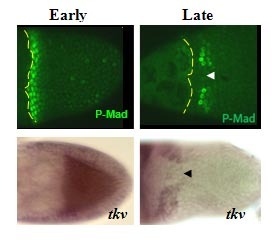 TKV is necessary for BMP signaling and eggshell morphogenesis. Dorsal structures on the Drosophila eggshell are highly diverse among species. The most prominent structures are the tube-like dorsal appendages that are different in numbers and shapes among species (A”, B”, C”). For example, D. melanogaster has two (A”), D. busckii has four (B”) and D. guttifera has three DAs (C”). We hypothesized that this diversity reflects changes in the pattern of BMP signaling. Indeed, in reference to the position of the future roof domain of the appendage (marked by BR in red, and broken red line), the pattern of BMP signaling (green and marked by the yellow line) is different among species. The BMP signaling overlaps the BR domain in D. melanogaster (A, A’), or in addition to overlapping BR it appears in the adjacent domain in D. busckii (B, B’), or be absent from the BR domain in D. guttifera (C, C’). Remarkably, we found that differences in BMP signaling among species are determined by the pattern of tkv. While TKV is necessary for BMP signaling, it is not sufficient. We found the type II BMP receptor, Wishful thinking (WIT), is expressed in an early P-MAD overlapping pattern (A1, B1, C1). 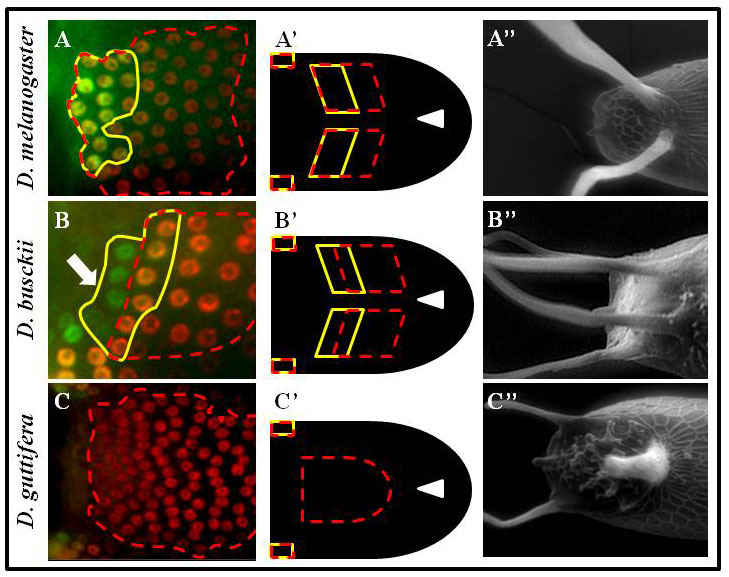 WIT is necessary for BMP signaling, follicle cells’ patterning, eggshell morphogenesis and development (A-E’). Additional genes have been associated with shaping BMP signaling in tissues. Currently, we study other components of the pathway to determine their involvement in the dynamics, intensities, and shapes of the BMP signaling in epithelial tissues. Changes in gene regulation are associated with the evolution of morphologies. However, the specific sequence information controlling gene expression is largely unknown and discovery is time and labor consuming. We used the intricate patterning of follicle cells to probe species’ relatedness, in absence of sequence information. 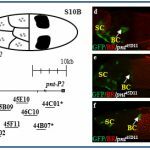 We focused on one of the major families of genes that pattern the Drosophila eggshell, the Chorion protein (Cp). We systematically screened for the spatiotemporal patterning of all nine Cp genes in three species: D. melanogaster, D. nebulosa, and D. willistoni (A-C). Applying an annotation code, we transformed the data into binary matrices (D) that captures the complexity of gene expression. Gene patterning is sufficient to predict species’ relatedness, consistent with their phylogeny (E). Surprisingly, we found that expression domains of most genes are different among species, suggesting that Cp gene regulation is rapidly evolving. In addition, we found a morphological novelty along the dorsal most side of the eggshell, the dorsal ridge (DR, in B and C). Our matrix analysis placed the dorsal ridge domain in a cluster of epidermal growth factor receptor (EGFR) associated domains. We are currently studying the mechanism underlying dorsal ridge formation. In a recent screen for cis-regulatory modules, we discovered new domains for gene expression. Some of these patterns recapitulated the partially or fully the endogenous associated gene-pattern. 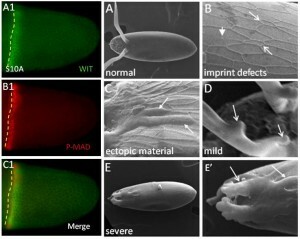 These lines are a new resource for GAL4 drivers to manipulate genes during oogenesis. Page last updated at 2:34 pm April 7, 2018 . This page was printed from yakoby.camden.rutgers.edu/research/ on Friday, April 19, 2019.